Out of the conflict of the American Revolution a group of colonists remained loyal to the British Crown. Experiencing loss and persecution they sought refuge and a new homeland in Canada. The refugees numbered over 80,000, and included people from every walk of life; farmers, clerks, clergymen, lawyers, labourers, slaves, craftsmen and people who could not even write. In 1784 four ships, the Snow Liberty, the St. Peter, the Brig Polly, the Hoy St. John and the whaleboats carried over 400 people to the shores of Bay des Chaleurs where they were given supplies and later drew land grants for new homes in a townsite that was to be called New Carlisle. The people were to become known officially as United Empire Loyalists. They established the foundations for education and justice, became farmers and fishermen, built ships and sailed them, and consecrated places of worship. 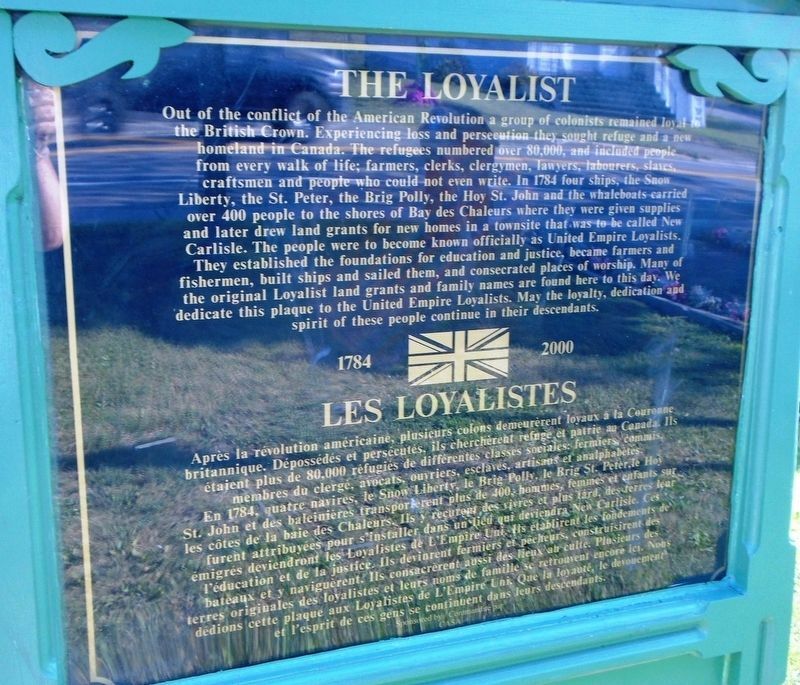 Many of the original Loyalist land grants and family names are found here to this day. We dedicate this plaque to the United Empire Loyalists. May the loyalty, dedication and spirit of these people continue in their descendants. Après la révolution américaine, plusieurs colons demeurèrent loyaux à la Couronne brittanique. Dépossédés et persécutés, ils cherchèrent refuge et patrie au Canada. Ils étaient plus de 80,000 réfugiés de différentes classes sociales: fermiers, commis, membres du clergé, avocats, ouvriers, esclaves, artisans et analphabètes. En 1784, quatre navires, le Snow Liberty, le Brig Polly, le Brig St. Peter, le Hoy St. John et des baleinières transporterent plus de 400, hommes, femmes et enfants sur les côtes de la baie des Chaleurs. Ils y recurent des vivres et plus tard, des terres leur furent attribuyées pour s'installer dans un lieu qui deviendra New Carlisle. Ces émigrés deviendront les Loyalistes de L'Empire Uni. Ils établirent les fondements de l'éducation et de la justice. Ils devinrent fermiers et pêcheurs, construisirent des bateaux et y naviguèrent. Ils consacrèrent aussi des lieux au culte. Plusieurs des terres originales des loyalistes et leurs noms de famille se retrouvent encore ici. Nous dédions cette plaque aux Loyalistes de L'Empire Uni. Que la loyauté, le devouement et l'esprit de ces gens se continuent dans leurs descendants. 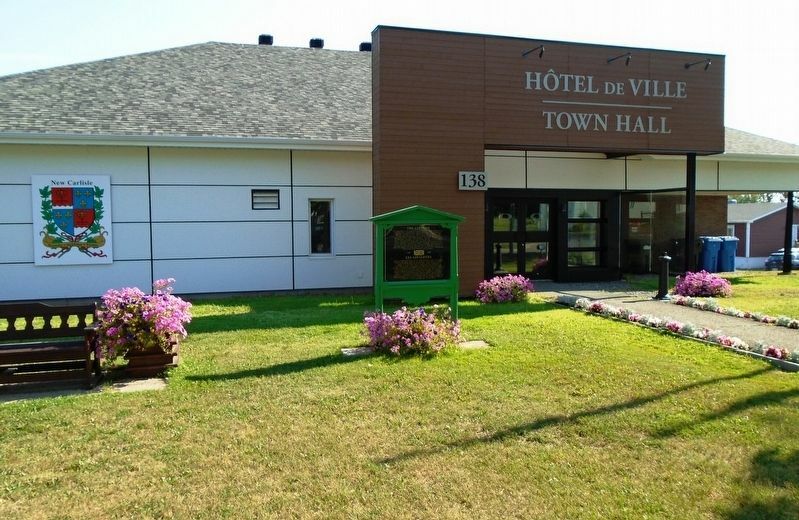 Erected 2000 by Commandité par CASA. Location. 48° 0.562′ N, 65° 19.704′ W. Marker is in New Carlisle, Quebec, in Bonaventure MRC. Marker is at the intersection of boulevard Gérard-D.-Levesque (Quebec Route 132) and rue Réne-Lévesque, on the left when traveling west on boulevard Gérard-D.-Levesque. Touch for map. Marker is on the Town Hall grounds. Marker is at or near this postal address: 138 boulevard Gérard-D.-Levesque, New Carlisle, Quebec G0C 1Z0, Canada. Touch for directions. Other nearby markers. At least 7 other markers are within walking distance of this marker. L'eglise presbyterienne - Knox Presbyterian Church (within shouting distance of this marker); Maison Tremblay House / L'eglise Unie Zion United Church (within shouting distance of this marker); La naissance de New Carlisle / Parc municipal (about 90 meters away, measured in a direct line); War Memorial (about 90 meters away); Légion Royale Canadienne / Palais de Justice (about 90 meters away); L'Eglise anglicane Saint Andrew's Anglican Church (approx. 0.6 kilometers away); L'education - New Carlisle High School (approx. 0.7 kilometers away). More. Search the internet for The Loyalist / Les Loyalistes. Credits. This page was last revised on February 24, 2019. This page originally submitted on February 24, 2019, by William Fischer, Jr. of Scranton, Pennsylvania. This page has been viewed 44 times since then. Photos: 1, 2. submitted on February 24, 2019, by William Fischer, Jr. of Scranton, Pennsylvania.